Currently acoustic tag-detecting autonomous receivers must be visited periodically to download the files of tag detections. Hence, the information about the whereabouts of tagged fishes is not available to make prompt regulatory decisions to reduce entrainment. In contrast, real-time receivers can detect the signal from a transmitter on a passing fish and immediately transmit its identity and time of detection to a website, where they can be viewed on either a computer or cellular telephone. Real-time nodes can aid regulatory biologists in making important decisions. This is a powerful new tool for resource managers and conservation biologists. We describe a network of real-time, fish-tracking nodes on the Sacramento River, California. Two case studies illustrate the value of the nodes. The first entails detecting the arrival of migrating winter-run Chinook salmon near a water diversion and alerting regulatory biologists to keep the diversion closed to increase the migratory success. The second study involves the detection of green sturgeon at potential stranding sites, alerting biologists of the need to transport them from that site to the main channel of the river so they can continue their upstream migration to their spawning sites. Individually coded acoustic tags and tag-detecting stationary receivers were developed in the 1980s to describe site fidelity of sharks at coral reefs  and seamounts [2, 3]. Although this technology was first used to ascertain the degree of residency of highly mobile species at biotic “hot-spots” in the ocean , it has been used even more frequently to determine rates of movement and reach-specific survival of adult anadromous fishes on their upstream migrations to their spawning sites within rivers and juveniles migrating downstream to the ocean . By 2012, there were 378 published studies utilizing this methodology . Autonomous receivers allow the collection of detection data from remote sites without personnel being present. However, the files of tag detections stored in the receivers must be downloaded periodically, and for this reason equipment failure and the resulting loss of data are not detected until these infrequent visits are made. In contrast, real-time receivers can record the passage of tagged fish and immediately transmit their identities and times of detection at a particular location to a website, where they can be viewed on either a computer or cellular telephone. Regulatory biologists can access the data on the website to help them make important decisions. The viewer can find out whether the receiver is operating by simply checking whether a full is voltage displayed on the website. A real-time node must be distinguished from an autonomous receiver. The former is composed of a variety of receivers, a mooring within the river, a submersible cable, a circuit board, modem, and battery enclosed within a waterproof box, with a cable leading from it to an array of solar cells. This is an emerging capability, which has recently been used in remote area of the ocean to monitor the residence times and depth preferences of four species fishes at a fish aggregating device (FAD) . An acoustic receiver transmitted behavioral information to via the Argos satellite to a base station in real time. There is a critical need for real-time detection of fishes in the Sacramento River. There are two runs, winter and spring, of Chinook salmon (Oncorhynchus tshawytscha) that are listed as endangered and threatened by the Environmental Protection Act (ESA). Both encounter numerous water diversions as they migrate down the river and through the delta. Furthermore, the green sturgeon (Acipenser medirostris) migrate to the upper river to spawn and can become disoriented and stranded within these diversions. In response to the current extended drought conditions in California, state and federal agency regulators must balance the competing needs of endangered and threatened fish species for limited water resources with the needs of society to use water for urban, industrial, and agricultural demands. During the winter of 2015, water levels in the Sacramento–San Joaquin Delta became very low, and there was pressure to open the Delta Cross Channel (DCC) radial gates to import more water into the interior Delta to be exported to Southern California through the state and federal water diversions. However, at the same time it was imperative that this action would not jeopardize the safe passage of Chinook salmon smolts to the ocean. Perry et al. 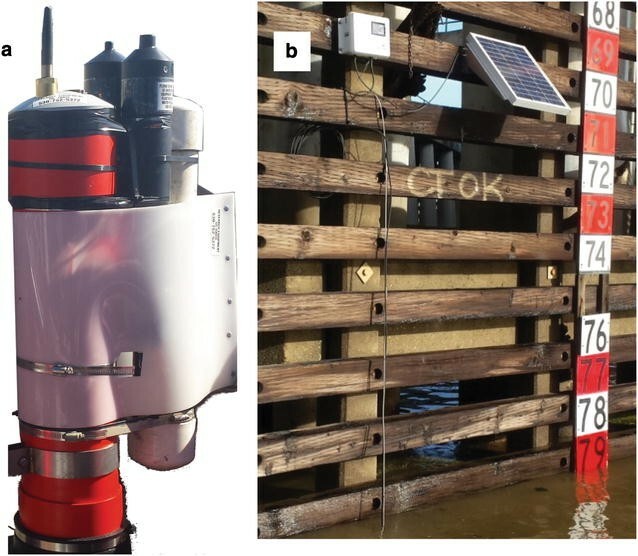 , using coded acoustic tags and an array of tag-detecting receivers, determined route-specific survival of the smolts through the main channel and three routes through the Delta. A higher rate of survival was recorded during December 2006 when the DCC gates were open than during January 2007 when they were closed. Furthermore, Steel et al. , using a 2-D tracking array, showed that juvenile salmon were diverted from the main channel of the Sacramento River into the Delta when the gates of the DCC were open. Based on these two studies, regulatory biologists recommended the closure of the DCC gates when winter-run smolts arrive in their vicinity. In contrast, the Sacramento River during wet years will flow over the Fremont Weir at the northern end of the Yolo Bypass and move in a southerly direction through the bypass avoiding the City of Sacramento . The fast moving waters in the bypass serve as a false attractant to the green sturgeon moving upstream during their spawning migrations. They become trapped at the top of the Yolo Bypass south of the Fremont Weir when the Sacramento River recedes from flood stage, and the elevation of the river falls below the crest of the weir . The California Department of Fish and Wildlife (CDFW) was notified by local fishermen during 2011 that numerous sturgeon were stranded in shallow pools behind the Fremont and Tisdale Weirs after a series of rain storms. The sturgeon were trapped when the flows in the Sacramento River subsided, consequently lowering the height of the river below the crest of the weirs. A total of 24 green sturgeon were captured, transported, and released into the Sacramento River above the weirs . Fisheries biologists have advocated on an international level using real-time biotelemetry to make management decisions . Real-time information about water temperature and rate of flow in the Fraser River, Canada, is currently being used to make within-season management decisions, and there is keen interest in relating these environmental drivers to the movement rates and reach-specific survival of fishes using similar tag-detection nodes . Some have argued that telemetry is not relevant to conservation . The approach described here alleviates this concern, providing specific examples where biotelemetric data have been used to make important management decisions. We will first describe the components of real-time nodes that provided real-time reporting of the passage of fishes during the drought in the Sacramento River and Delta in California. Two examples will be given illustrating the value of these nodes. The first involves the two runs of Chinook salmon, winter- and spring-run. Regulatory biologists were alerted during winter 2015 of the arrival of hatchery-raised winter-run Chinook salmon near a water diversion, which was kept closed based on this information. Furthermore, the absence of the detection of tagged spring-run by a real-time node in Sacramento led regulatory biologists to increase the pulse of water coinciding with the release to enhance the survival of the smolts. The second example consisted of alerting rescue crews of the passage of adult green sturgeon (A. medirostris) past the Yolo Bypass, a potential stranding site, during their upstream spawning migration during spring 2016. The real-time nodes contained up to three receivers with hydrophones with different frequency sensitivities (Fig. 1). Two of the receivers, which were manufactured by Vemco Ltd (Halifax, Nova Scotia), detected the interval modulated signals from 69 and 180 kHz emitting transmitters. The third receiver, produced by Teknologic Engineering (Edmunds, Washington), detected phase-shifted signals from 416 kHz emitting Juvenile Salmon Acoustic Telemetry System (JSATS) transmitters. The components of the real-time system are shown in Fig. 2. A waterproof bulk-head connector attached to each receiver. Three short cables were molded together into a single 30-m long cable ending in a bulk-head connector (SEACON, Underwater Electrical and Fiber Optic, El Cajon, San Diego) that plugged into a communication control center (CCC) on shore. The waterproof housing contained of a cellular modem, GPS, and voltage regulator. The first-generation CCC used a cellular modem with integrated GPS manufactured by Netronix Inc. (Philadelphia, Pennsylvania), which transmitted cellular packets to through a cellular tower to an in-house server. The second-generation CCC uses a microprocessor (Raspberry Pi)-controlled cellular modem interfaced both with a GPS and with a voltage regulator (Teknologic Engineering, Edmunds, Washington). It communicates with local cellular towers, delivering cellular packets to the Amazon Cloud. The cellular signals from the CCCs may not be strong enough depending upon proximity to cellar tower, and in these cases a cellular signal booster and an external antenna are connected to the unit to increase signal range. A 40-watt solar panel provided power to the CCC. The first-generation CCC could operate for 24 h without charging; the second-generation could operate 4 or 5 days without charging. Concern should be given when selecting a battery for the CCC—the larger the amp hour rating of the battery, the longer the CCC will operate without external charge. This is an important consideration because charging may be limited when the skies are overcast, and transmission would stop upon discharge of the batteries in the CCC. The first-generation real-time, tag-detection system was an expansion of “Environet,” a website devoted to the display of environmental data hosted by Netronix Inc. This site can be accessed at https://environet.com by entering the following email address: mjthomas@ucdavis.edu and password “getdata.” The second-generation real-time, tag-detection system was developed by the biologists of the Biotelemetry Laboratory in conjunction with the engineers of Teknologic Engineering and named the Biotelemetry Autonomous and Real-Time Database (BARD). To access this site, use the following address: http://sandbox5.metro.ucdavis.edu/landingmap. Following is a description of the steps taken in data acquisition and processing by both the first- and second-generation real-time detection nodes (Fig. 3). The date, time, and identify of each tag detected are stored in the memories of the three receivers. Environet polls the receiver every minute for the detections recorded, whereas the BARD can poll the receivers at any time interval. A fundamental difference between the two systems is that the former assigns a GPS time stamp every minute to each tag-detection event, while the latter takes the time stamp with sub-minute temporal resolution from the receiver. It is important to have sub-minute temporal resolution for JSATS detections because these transmit phase-modulated bursts every 5 s, and error checking involves determining of six or more packets occur sequentially—and this likely occurs within a minute. Environet could provide the same minute time stamp to as many as 24 detections occurring at different times. The low temporal resolution to data acquisition at Environet is due to the large volume of data processed by the system, hosting data acquired from many nodes worldwide. Metadata taken from the JSATS receiver and CCC are also paired with the detections in the second-generation node. The data in the Netronix CCC are transmitted via modem to the cellular tower and written to the Netronix server. The uploaded information is provided in table and graphic format on the Environet website. The interface extracts from the server information based on monitor location and date range. The data transmitted from the Teknologic modem through the cellular tower to the Amazon cloud server. The Cloud is periodically queried using Python, and the data files are assimilated into the SQL database. The BARD web interface permits both tabular and graphic display of the data. The advantages and disadvantages of the two systems are given in Table 1. The BARD has greater temporal resolution to tag detection. If Environet does not operate or reception is lost to the node, all of tags detected over the intervening period of time are given the time stamp when the website goes online again. The time resolution of the second-generation node is greater since the time stamps are those of the receivers not the Netronix cellular server. The space on the Amazon cloud exceeds that of the Netronix server, and the latter is limited to 20 detections per minute, whereas the BARD can upload many more detections per polling. Finally, a convenience to the BARD is that a list of specific IDs can be entered into the website and the detections will be displayed with color coding for the different nodes when detections are plotted over time. Again, the ability to display multiple locations by the BARD in contrast to the single location of Environet is a plus for the former node. The home page of the BARD website displays the locations of all of the monitors in the Sacramento–San Joaquin watershed (Fig. 4). You can zoom in on particular areas by using the mouse wheel or the plus symbol in the lower right of the map. If one positions the cursor over a symbol, the name of the location and geographical coordinates of the receiver will be displayed with river kilometer (from Golden Gate span). The color of the symbol indicates the types of receivers present on the nodes, 69, 180, or 416 kHz, the shape, circle or triangle, whether it is autonomous or real time. Note the triangle, indicating the real-time monitor at the Capital City Freeway Bridge leading to the city of Sacramento slightly above the cluster of receivers in the Delta. A rectangle can be drawn around a particular area, and then, a button become available in the upper left just above the map. If it is selected, a page is displayed with the recent detections for those monitors within the area. If you select the tab, “RECENT DETECTIONS,” on the site navigation panel, this will bring up a page, which permits you to specify a range of time and choose locations by clicking on them once (Fig. 5). A bar to the right of the window enables you to select the receivers, from which detections are to be displayed both in a table and in a graph. Once you select locations, they will appear in the box in the right. These lists of detections at particular locations can be saved and the names of the lists shown below the selected locations list. Below these two menus are displayed a plot of detection evens and a table of the detection events. The total number of detections can be plotted over specified time period. Shown is a plot of the detections from three receivers, located at Antioch Bridge, Benicia Bridge, and the North Fork of the Mokelumne River time of year in Pacific Standard Time (Fig. 5). A stacked histogram is displayed, in which the number of detections at each location is specified by a different color with the height of the cumulative total being the total count of detections at all three sites. If you select “TRACK A FISH” on the site navigation panel, more can be learned about the movements of tracked fish (Fig. 6). If you enter a date range and a list of tags on individual fish, the identities of tags with detections are displayed as buttons below the “Results” header. If a particular tag of interest is selected, the detection events will be listed in chronological order at the different receivers detecting the traveling fish. Each record displays the date and time of detection along with the name of the location detected. To the right of this table is a map that displays the track as a series of line segments and the locations detected with “baloons.” Note that there is an “S” at the start of the track and an “E” at the last location detected. Below is graph of the locations of the fish over time, given in river kilometer. The graph shows the movement of tag 4331, a green sturgeon carrying a 69-kHz beacon, beginning on the 13th of January as it migrated downstream from its summer and fall spawning region at 340 rKm to arrive at the Delta at the 18th the confluence of the Sacramento River and the Delta. It stayed in this region through January 21, 2010. The specific information for this tag is displayed under visit number 8 on the table below the graph. Further development of this telemetric portal is ongoing. We would like to add additional capabilities. We will be deploying an environmental sonde from Eureka Sensors, which has sensors of temperature, salinity, pH, dissolved oxygen, turbidity, and chlorophyll A. It is our intention to eventually display these data upon the website. Also addition diagnostic metadata will be displayed such as the voltage of the communication control center in order to know that the battery is charged and the solar panel is connected and functional. The staff of the Biotelemetry Laboratory maintains the array of autonomous and real-time receivers as a service for many researchers in private and state universities, consulting companies, and state and federal agencies (Fig. 7). Two hundred and five receivers (VR-02, Vemco Ltd, Halifax) are distributed at 50 locations in the Sacramento–San Joaquin watershed. The receivers are deployed at 20-km intervals along the length of the Sacramento River, stretching from the confluence of Battle Creek to the Delta. Receivers are distributed throughout the Delta at water-way junctions. There have been cross-bay arrays at the Carquinez, Benicia, and Raccoon Straits as well as across the Richmond, Bay, and Golden Gate Bridges. Scientists from these organizations can not only access detections of their fish from a large array of autonomous monitors by contacting the database manager at the Biotelemetry Laboratory, but also obtain records of the detection of fish at the real-time nodes by logging on to Environet or BARD. There is an Array Maintenance Committee, composed of one scientist from each organization that meets twice annually. The Biotelemetry laboratory provides an update of the status of the array at these times, and the committee can request the deployment of additional receivers, either autonomous or real time in nature. During the winter of 2015, six real-time nodes were deployed along with the much larger array of autonomous receivers (see red triangles, Fig. 7). Five of the real-time receivers were deployed to detect the passage of winter- and spring-run smolts on their downstream migration. The real-time nodes at Tisdale, Sacramento, Hood (see nodes 4, 3, and 2), would detect when salmon smolts were approaching the location of the DCC (see Node 1, Fig. 8). The station at Middle River is located downstream of the two major state and federal water export facilities [State Water Project (SWP) and Central Valley Project (CVP)] that pump Delta water to the southern San Joaquin Valley and Southern California (see node 6). Net water movement is typically “upstream” in this tidally affected area under the influence of the export actions and tides, moving toward the SWP and CVP facilities. This node was deployed to detect individuals approaching the SWP and CVP. Movement rates of juvenile winter-run Chinook salmon could be calculated based on the difference in the time of arrival at the three real-time stations on the Sacramento River above the DCC (Tisdale, City of Sacramento, and Hood to estimate when these smolts would arrive at the two diversions and become entrained within them. A sixth real-time node was deployed in the Yolo Bypass to detect whether any green sturgeon might become stranded below the Freemont Weir. During the winter of 2016, 16 real-time nodes were established at a ten sites in the watershed. On the Sacramento River upstream to downstream, paired nodes were set up at Colusa, Tisdale Weir, Knights Landing, Feather River, The I-80 and Tower Bridges near the city of Sacramento. The last two paired nodes were less than a kilometer apart, permitting a final determination of probability of detection. Those winter-run that migrated this far downstream were detected at both paired nodes, providing a 100% detection efficiency, and this facilitated the estimation of the rate of survival between the successive paired upstream real-time nodes. Arnold Ammann gave sixteen biweekly updates with the percentage of fishes reaching the successive pairs of nodes downstream of the release site ending on March 3, 2016. These nodes are currently being upgraded to the second-generation architecture. We will now present two examples where information about tagged fish from the real-time nodes proved useful to resource managers. It is not our intent in this communication to present the detailed scientific results from the studies of these fish but to illustrate how the real-time detection of fish can be used by managers in making regulatory decisions. This same approach could be used with terrestrial species that aggregate at sites. The timing of the arrival of the smolts at the gates depends on river conditions. These can change rapidly, and the timing of the changes varies among years. The nodes enabled the gates of the DCC to be closed prior to the arrival of fish in 2015. In early February 612,056 hatchery produced winter-run Chinook salmon were released from the Livingston Stone National Fish Hatchery into the upper Sacramento River at Caldwell (rkm = 569) near Redding, California, in advance of an approaching winter storm. There were two releases of fish, one on the 4 and another on 6 February. Acoustic tags were placed within the body cavities of a subsample of these fish—250 fish in the first release and 322 fish in the second release. The subsamples of tagged fish gave resource managers an additional way of tracking the downstream movement of the larger hatchery releases in addition to the fyke nets operated within the river. Arnold Ammann of the National Marine Fisheries Service (NMFS) queried the real-time nodes at Tisdale, Sacramento, Hood, and DCC real-time nodes daily to provide updates of the number of tagged smolts that were detected at these sites. The salmon winter-run smolts were first detected at Sacramento on February 8, 2015, 4 days later than the first release date. The peak numbers of fish passed by Sacramento on 9 and 10 February with steadily decreasing numbers passing over the next 24 days (Fig. 9). A total of 50 tagged fish were detected during those 2 days, which coincided with a 20,000 cfs increase in the flow in the Sacramento River from 5000 to 25,000 cfs, measured at the USGS flow gage at Wilkins, California. One hundred and fifty-two smolts were detected of the 572 tagged smolts released at Caldwell at rkm 569. Ammann alerted regulatory managers in Sacramento on 8 February, only 4 days after the first release, that tagged winter-run smolts had been detected at the Sacramento real-time node, not far from the DCC that connects the Sacramento River with the Delta. The regulatory biologists did not anticipate the rapid arrival of the hatchery fish at the Sacramento. The winter-run hatchery releases during 2014 took a much longer time to reach Sacramento. These smolts were released at Caldwell on February 10, 2014, in anticipation of a pulsed flow that increased 5000 cfs from 5000 to 10,000 cfs measured 2 days later. However, the peak of 48 smolts did not occur until 20 days on March 2, 2014, coinciding with a second 6000 cfs increase from 4000 to 10,000 cfs. Based on this prior information, resource agencies planned to open the gates throughout February to divert water into the interior Delta to improve water quality. The agencies believed that the fish would take 3 weeks to a month to reach the DCC gates. The prompt arrival of winter-run smolts at Sacramento on February 6, 2015, convinced the agencies to keep the DCC closed through March 2015, reducing additional mortality to the 2015 hatchery winter-run releases due to diversion into the Delta. During winter 2016, we deployed 16 real-time nodes at a ten sites in the watershed. On the Sacramento River upstream to downstream, paired nodes were set up at Colusa, Tisdale Weir, Knights Landing, Feather River, The I-80 and Tower Bridges near the city of Sacramento. Ammann gave sixteen biweekly updates with the percentage of fishes reaching the successive pairs of nodes downstream of the release site ending on March 3, 2016. Real-time reporting proved useful also in monitoring downstream migration of the spring-run smolts during 2015 and 2016. The Feather River Fish Hatchery released smolts at two locations, Gridley and Boyds Pump Boat Ramps, on the Feather River late March 2015. A subsample of 75 acoustically tagged fish accompanied each release of hatchery fish to permit immediate monitoring of their downstream migration success. A supplemental pulse of water of 440 cfs was released from Oroville Reservoir to stimulate downriver migration. Only one tagged individual from the upstream release at Gridley and seven from the downstream release site at Boyds Pump, or 5.3% of the total, reached the single real-time node near the city of Sacramento (Arnold Ammann, NMFS, unpub. data). The Feather River Hatchery Oversight Team decided to release the rest of the hatchery-raised spring-run on 2 April rather than the traditional mid-April date and to accompany them with a larger release of water of 1400 cfs (Jeffrey Stuart, NMFS, pers. commun.). A total of 12 (8.0%) of the 150 tagged smolts released at the two sites were detected at the Sacramento node (Arnold Amman, NMFS, unpub. data.). During the El Niño conditions of spring 2016, 54 (27%) of 200 tagged smolts were detected at the Sacramento nodes (Colin Purdy, CDFW, pers. commun.). These smolts not only exhibited higher migratory success but also moved downstream faster than smolts during spring 2015. This higher survival and faster movement coincided with the higher flows in the Sacramento River during 2016. Researchers in Washington and California have pleased long-term coded tags beacons within the abdominal body cavities of nearly 400 Green Sturgeon over the past 10 years. The information on sizes, weights, timing of tagging and release are contained in the California Fish Tracking Consortium database. The batteries with lives ranging from 3 to 10 years have made it possible to monitor repeated upstream migrations of green sturgeon in the Sacramento River system. Adults return to spawn in the Sacramento River approximately every 2–5 years (unpub. data, Michael Thomas). This success led CDFW to support the development of the real-time node. One real-time node was immediately situated in the Yolo Bypass downstream of Lisbon Weir and one on the main stem of the Sacramento River downstream of the Tisdale Weir, where green sturgeon might strand (nodes 5 and 4 in Fig. 5). These two nodes enable CDFW now to better respond to sturgeon stranding at the two bypasses. The nodes detected 23 green sturgeon during their spawning season from late February to late June 2015. The passage of tagged fish are indicated by solid circles superimposed on a hydrograph of the river stage, or height in meters (Fig. 5). The river height, measured at the Fremont gage, ranged from 5.2 m from the end of February to 3.5 m by the end of June, well below the 12 m height that would result in flooding. Regulatory biologists concerned with the protection of this species were given weekly alerts by Matt Pagel, the Database Manager in the Biotelemetry Laboratory, during the spawning season. The winter-run race is classified as endangered under the Endangered Species Act. Winter-run adults migrate up river from December through July, with a peak during the period between January and April. Adults hold in a section of the Sacramento River between Keswick Dam and approximately the location of the Red Bluff Diversion Dam until they commence spawning. They spawn between late-April and mid-August, with a peak in June and July as reported by CDFW annual escapement surveys. Young of the year winter-run Chinook Salmon begin to emigrate downstream from their natal river reaches in fall into the lower Sacramento River and typically reach the area of the DCC gates starting in late winter (mid-January and February). Elevated river flows associated with storm events stimulate this downstream movement. The decision to keep the DCC closed was based upon information passed on to the managers of the state and federal resource agencies, including the Assistant Regional Administrator of the California Central Valley Office of National Marine Fisheries Service (NMFS). NMFS is responsible for the protection of anadromous species listed under the ESA in the Sacramento River. During the drought operations in the winter of 2015, the resource managers from the different state and federal agencies met frequently to coordinate operations of the water infrastructure of California to provide water for both public and environmental demands. These managers cooperated to ensure safe fish passage past federal, state, and private water diversions and manage appropriate releases of water from dams to support fisheries. A flow diagram is presented showing the consequences of either detecting juvenile winter-run at the Sacramento real-time node or not detecting them (Fig. 10a). In the first case, the resource agencies recommended that the Delta Cross Channel remained closed based on the detection of hatchery-raised, winter-run smolts at the Sacramento node. However, later that year, the gates were opened on May 14, 2015, to May 18, 2015, “to meet the water quality standards in the Bay-Delta,” a week earlier than would have been allowed under present operating criteria. The resource managers determined that the level of risk to listed fish was sufficiently low to allow flexibility in the DCC gate operations. The alerts were provided on a daily basis during 2015–2016. After getting daily updates, Maria Rea, Assistant Regional Administrator, NMFS, wrote the following email to emphasize the importance of real-time reporting. Thank you so much for all your daily reporting. I want to let you know how helpful it is to get this kind of “real-time” information, as the Directors of the five agencies continue to meet by conference call every morning at 8 am to go over all information and decide on the best balance of water exports and fish protection for the day. …I really appreciate you accommodating the management needs in the continuing drought (Maria Rea, pers. communication). In conclusion, real-time information about the whereabouts of winter- and spring-run smolts is enabling resource managers to make more timely decisions with regard to the closure of a water diversion and the magnitudes of supplementary water releases. The nodes enabled rescue workers to know when to search for stranded green and white sturgeon. The process that leads to rescuing sturgeon stranded downriver of major weirs is also shown in a decision tree (Fig. 10b). In periods of no or negligible risk, search efforts for stranding sturgeon can be curtailed as in 2015. Alternatively, the CDFW can quickly begin monitoring and performing rescue efforts during years or months when flood stage is reached, weirs are overtopped, and tagged fish are detected entering the lower ends of the bypasses. In addition to pre-rescue monitoring, the array permits agency biologist to get routine updates on whether the rescued sturgeon move upstream or downstream in the Sacramento River. The value of this information can be appreciated in an email sent by Mr. Colin Purdy, the lead biologist on the rescue team to Mr. Pagel, the Database Manager in the Biotelemetry Laboratory, who furnished biweekly updates. Thanks again for these detailed updates and apologies for the confusion on metadata. The white sturgeon rescued on 31 March 2016…is moving downstream (≈40 river miles). We believe this was a spawned out female so this downstream behavior seems appropriate. I am always glad to get reports of fish moving around after being rescued as it shows they survived and our efforts were not in vain (Colin Purdy, pers. commun.). The two case studies presented within illustrate a real success story of researchers from the resource agencies working closely with researchers in academia to utilize conservation-based information in protecting listed species. In the first case, the information was rapidly transmitted to the regulatory division of NMFS, which quickly disseminated it to the other federal and state resource agencies for timely management decisions. In the second case, the information was relayed to the lead biologist of a sturgeon rescue crew at CDFW. This real-time technology permits resource managers to take an adaptive approach to balancing the public’s need for water with the needs of migratory fishes. The success of the case studies presented here relied heavily on a mutual cooperation among researchers and resource managers during this period of drought in Central California. APK obtained the funding, oversaw the development and deployment of the real-time nodes, and wrote the paper. AJA provided the detection data for winter- and spring-run Chinook smolts. TVA led the team deploying and maintain the array of real-time detection nodes. RDB deployed and maintained the real-time monitors. MDP maintained a SQL database of tag detections, provided weekly updates of sturgeon detections during their spawning season, and edited a draft of the paper. MJT developed a prototype real-time node working closely with engineers from VEMCO-Amerix, Netronix, and Teknologic Industries, and helped in their deployment and maintenance. All authors read and approved the final manuscript. Jeffrey Stuart, a Fisheries Biologist in the California Central Valley Area Office of NMFS, participated in the development of the manuscript. Brent Smith of Teknologic Engineering added the real-time capability to the 416-kHz-sensitive JSATS monitors and is currently working with Biotelemetry Laboratory of UC Davis to improve the real-time monitoring stations. Dale Webber of VEMCO-Amerix oversaw the integrated cabling of the 69 and 180 kHz receivers to provide similar outputs. Vaseilios Nasis of Netronix added the capability of displaying tag detections in graphical and tabular format on Environet. We want to express our gratitude in particular to the second reviewer of this manuscript for giving us guidance in reorganizing the flow of the article. The records of spring-run Chinook smolt detections plotted in Fig. 8 are available from Mr. Arnold Ammann, Research Scientist at the Southwest Fisheries Center, Santa Cruz. The records of green sturgeon presented in Fig. 9 are available from Mr. Matthew Pagel, Database Manager at the Biotelemetry Laboratory at UC Davis. All of the authors consent to this role in the preparation of this article. The real-time stations were developed by members of the Biotelemetry Laboratory of the University of California working closely with the engineers from the above-mentioned companies. The systems were designed, the individual components purchased, and assembly completed with a grant to APK entitled, “Expanding fish tracking array with real-time monitoring of tagged sturgeon and salmonids” (E1183018) from the California Department of Fish and Game’s Ecosystem Restoration Program.